At this point, it looks like Funko is never planning to release another set of Ready Player One action figures, so rather than forever have an incomplete group in my collection, I took those back to the store and got the key set, instead. Will reach The End where the prize awaits. The final two lines are the same in both, but the changes in the first couplet point to the differences in the story: in the book, first you found the location of the key, win it in a challenge, go find the gate it opened, and finally beat the trial within; in the movie, all you had to do was find and win the challenge, and you got a key, with no further effort needed. Basically, it was a way to streamline the story - a one-step process is much easier to film than a four-step process. Figuring out that the poem was referring to the D&D Tomb of Horrors module was simple, but finding where the tomb was proved to be the problem - despite pretty much the entirety of the human race spending all their time on it, it still took five years before Wade Watts figured it out. Doing it that way made it clear that Wade had the right mindset to understand Halliday's clues, that it wasn't just dumb luck that put him on top of the scoreboard; in the movie, there's a big car race that only requires being able to drive the right way. It's flashier and more appealing to a wide audience than watching Parzival wander through a dungeon, play a videogame, solve another riddle and then quote a movie, but it removes the agency from Wade by making the contest something that everyone else knows about. We're never even told what clue revealed it. The Copper Key is a simple item, with a circular bow featuring a double-A logo in the center. The shaft has angular swirls leading to the collar, and two very squarish bits. There are a few sections that you can tell are supposed to be hollow, but that would have been too difficult to mold in plastic, so they're just thinner than the rest. It doesn't ruin the look of the key, at least. And the key of Jade will be yours at last. Not only is the poem different, the entire challenge is, as well. In the book, you had to play through two different videogames; the movie version was the closest we got to the novel's "Flicksync" idea, where a player's avatar will be dropped into an existing movie to act it out (which is funny, since the second gate was the only one in the novel that didn't involve a Flicksync). The Jade Key has a slightly more ornate design than the Copper Key, with a bow that's got pointed triangular edges and a raised eagle pattern in the center. The shaft is blocky, with stair-stepped arrows, and the single bit at the end is as flat as a comb, with blunted teeth, a notched key ward on the front edge, and hexagonal patterns on the sides. Its overall design seems to be rather influenced by Native American art, which makes sense considering where in the movie it's found. So that brings us to the Crystal Key. In the book, beating the Second Gate rewarded you with an album cover, meaning you had to Guitar Hero your way to the key and its poem. Because what says "popular with children in the '80s" more than a concept album from 1976? And cannot be unlocked alone. Will be found in the fortress tragic. That keeps part of the same solution, but uses it another way. The keys aren't given a lot of description in the book, just their color/construction - Copper, Jade, Crystal. We are told one feature about the Crystal Key, however: it's got a caligraphic letter A, the only clue to where the Third Gate can be found. The movie version gets the same double-A logo seen on the other keys, but hey, that's just good branding. While the other two keys are molded from a surprisingly heavy plastic, this one is a lighter material - exactly what's needed to cast it in as pure a clear plastic as is humanly possible. The bow has a swirling pattern like the face of a sunflower, the shaft looks like it's been turned on a lathe, and the bit appears almost like a snowflake (suggesting the crystal teeth were grown, not crafted). Unfortunately, since these are technically toys and not replicae, they all have to be molded with copyright information - on the other two keys, it's not that noticeable, but the clear plastic here makes the ©WBEI lettering stand out plainly. The keys are sold in the same style of box as the figures, a horizontal rectangle with blue and white graphics. The entire front of the box slides off, like a lid, and the keys are held in a flocked blue plastic tray. The keys themselves all measure between five and six inches long, which seems to be life-sized? It's hard to tell when they only ever existed in a digital world, but it feels correct in your hand. 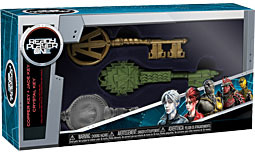 The Ready Player One keys aren't really a toy, more of a prop replica (though not nearly as expensive as some others we could mention). Then again, if it were possible to get an entire set of the Locke & Key keys, I'd be all over that, as well. Spielberg may have changed a lot for the movie, but the changes are mostly for the best (including a broader type of pop culture than the book did, strengthening the female characters, paring down the timeline, dropping Wade's digital stalking shtick, and adding an Indiana Jones twist to the final challenge), and unlike the action figures, no worries about this set being forever incomplete. And finally, someone once summed Ready Player One up in the following manner: "Billy Joel once write a song saying 'here's a list of things Baby Boomers have heard of, and I've set it to music.' It was a massive hit for some reason. Ready Player One is a long and tedious list of things Gen X has heard of, only it's not set to music." Well, now it has been! This entry was posted in blog exclusive review, Funko, videos. Bookmark the permalink. For a guy who loves to get on a soap-box about all terrible things non-liberal, you sure do seem to be into a movie/book that is basically a love letter to the man-children you call out on a weekly basis.